Marketing is a joint effort, between the publisher and author. It can be broadly divided into two: “traditional book marketing,” like presentation to stores, articles, radio, reviews in print magazines; and “new media,” like Twitter, blogs, podcasts, Facebook ads. At the “trade” end, selling to bookshops (see CHAPTER 16: SALES & ORDERING – INTRODUCTION TO SELLING YOUR BOOK), it’s mostly down to the publisher, though we do rely on the information you have already given us on your Book Details page. Signing events in bookshops can be very helpful in generating local interest, and that of course needs your involvement. At the other end, that of direct contact with potential readers, in social networking and online, it’s mostly down to you, the author (see CHAPTER 11: BEING YOUR OWN PUBLICIST). We cannot, for instance, as the publisher, supply reviews for your book to Amazon, or Goodreads. There are a range of marketing possibilities in between – writing articles, giving talks, getting interviews, getting print reviews, doing price promotions etc. (we explain these in depth in CHAPTER 11: MARKETING ACTIVITIES) – which need publisher and author. We explain the role you can play. We encourage authors to co-operate in our own closed forums. These forums exist so that authors can communicate ideas with each other; what has worked for them, what hasn't, requesting reviews between authors and sharing articles/interviews/reviews that may be of interest to other authors in the same genre. We encourage authors to share each others social media posts, as this increases the audience of posts, and also provides authors with interesting content for their own social media feeds. The general rule in marketing is that people usually have to see something five times to buy it. For a single view to sale conversion, you can expect about 2%. This is why we encourage the use of a central Database, to which all authors have access, so that we can learn from each other’s experiences, whether it’s with particular shops, or magazines, or more general indications of travel – what we find works in marketing, and what does not. Every expert will give a different answer. No one really knows, and the truth is that it’s different for different books, different authors. 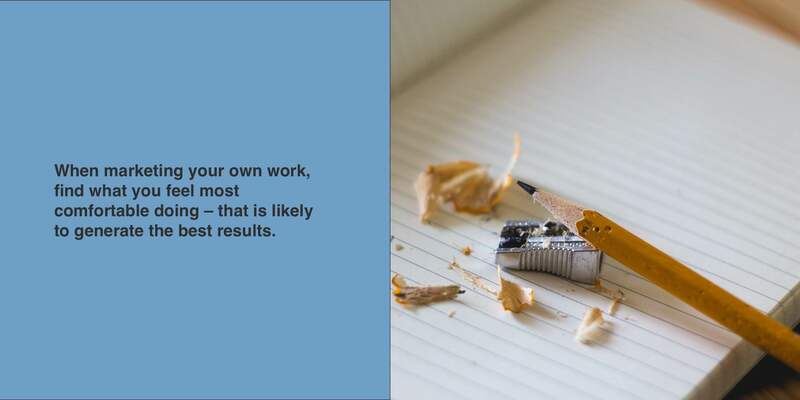 Find what you feel most comfortable doing – that is likely to generate the best results. Often the best and most sustained work that we're doing within the imprints though is the consequence of lots of tiny actions, that cannot be expressed in the way we record marketing. Where it really starts to work is when you get known as a “brand,” and can be promoted as an author, rather than by a single title. Author identity/author brand is hugely important; all of the industry stats suggest that the more devoted fans an author has, the better they do across multiple titles. To achieve this, some of it is “hard” promo, but most of it is “soft,” building a readership. Hence the emphasis in this Author Guide on social media, and on authors working together. Blogs, videos and podcasts can be key here, with authors retweeting them, moving them around on Facebook, Pinterest, Ello, Tumblr. Your social media presence is entirely up to you and the market that you are in, and your target audience. However John Hunt Publishing have their own social media networks, which you can find in CHAPTER 14: SOCIAL MEDIA – JOHN HUNT PUBLISHING BLOGS AND SOCIAL MEDIA NETWORKS. We will use these feeds in a variety of creative ways to highlight your book. It is why we encourage you to follow your imprint’s social media feeds, and tag us on posts about your book, as we will do on ours. That way we are constantly increasing the views on social media posts. Kill All Normies by Angela Nagle was launched in June 2017 to a huge wave of interest, online and off. Many reviews were written, and a lot of people discussed the book passionately over social media. At the time of writing, August 2017, there are over 80 reviews on Amazon.com. Tip #1. Build A Strong Author Platform. The marketing of Kill All Normies came together organically. Angela Nagle is a talented writer, well positioned, with a solid network of allies at various publications, and her book emerged out of her success writing about the neo-fascist right. Angela had spent a lot of time building her platform, publishing articles and essays specifically on the topic of her book (she writes for The Baffler, The Irish Times, Jacobin and Current Affairs Magazine), before it was published. People already knew about who she was and were interested in what she had to say. Tip #2. Start Pre-Publicity 6 Months or More in Advance. Before the book was published Angela promoted herself as an expert on the subject of the book, without necessary directly promoting the book, including multiple appearances on podcasts and radio programs, as well as many written articles for online media. Tip #3. Don’t Stop Promoting Once Your Book is Released. Often, authors put in a huge amount of energy promoting themselves up until their launch, and then stop once their book is out there. Crucially, Angela continued this work after the Kill All Normies launch, and will continue to do so. This is important advice for new authors, especially non-fiction ones. This kind of publicity should be an all-year-round effort, and will pay off in the long-term. Keep promoting the book, keep producing new essays on the topic, keep the interviews coming. The goal should be to get to a point where you have to start turning down interview requests. We were lucky in that Angela’s author platform was strong and that many people wanted to review Kill All Normies. With a sufficient amount of pre-publicity, and if you hit the right topical subject, you should be able to get at least a few people coming to you asking for reviews rather than the other way around. The importance of securing reviews, both in print and online, especially on Amazon and Goodreads, cannot be overstated. Easier said than done. Kill All Normies was the right book at the right time, addressing a raw issue the public consciousness. Obviously, not every book will hit the zeitgeist as Nagle’s book did. However, if you do the things that Nagle did and fail you’ll still have sold more copies than otherwise. A good comparison would be Enjoying It: Candy Crush and Capitalism. There was maybe 1/100th the amount of interest in that book as there was in Nagle’s, however the book sold a few hundred copies at the outset due to Alfie Bown’s hustle and the way he kept on publishing on his topic. Marketing your book can wait until the book is at least available for pre-order. See below Notes and Schedule. However there are things that you can do in preparation. See BEING YOUR OWN PUBLICIST and also AUTHOR BRANDING. Schedule: Copyediting, setting, proofing, design – usually takes two to three months. The publication date is then set for the last Friday of the month in ten months’ time. So for titles whose text and cover files are finished during January the publication date would be set for the last Friday in November. Why ten months? It takes this long for information to circulate through the trade worldwide, and this is essential to maximize your book's prospects of long-term success. We are represented by companies that are generally reckoned to be amongst the best independent sales teams around the world – NBN in the USA, Quantum in the UK, and Durnell in Ireland and Europe – and they can't start selling the book until they have the finished information. Once the files are final we produce an Advanced Information (AI) Sheet, or Tipsheet as it's known in the US, (see Chapter 16 Sales & Distribution – AI/Tipsheet/Newsletter) and we use that as the basis of our presentations to the sales teams. Who they present to is set out in the above chapter. This activity is not recorded on the Marketing page, as the work is outsourced. It takes the reps time to get around all their accounts. Buyers for the big chains such as Barnes & Noble, Waterstones etc., have monthly budgets for purchasing new titles, and these are settled well in advance of publication date. They won't buy books in without enough notice. Some key catalogues, like the NBN sales catalogue in North America, the bumper Bookseller Spring and Autumn editions in the UK, cover six months-worth of titles, they need the information on ISBN, page extent, price, sales copy, cover three months before that, so nine months only just gives us enough time. You may need copies of your book prior to publication date to sell at specific events or book launches. We can supply orders to you directly from the printer any time after the text and cover files are finished. However, we don't send books to the warehouses any earlier than six weeks before publication, because this causes any orders to be automatically released and sent to retailers. Amazon show a book as published as soon as they receive stock, which then conflicts with the information we've already sent out to the trade. So even if we supply you with books, direct from the printer, it will not be widely available to the public until publication. Please see CHAPTER 12: ONLINE SALES/AMAZON for more information about Amazon. Pre-orders: Books become available for pre-order on Amazon and other online retail sites the month after files are finished. The sales reps will be working hard to get pre-publication orders from all the main buyers. If you can get readers to pre-order your title from their preferred retailer this will aid the efforts of the reps and boost visibility; the best time to elicit pre-orders is in the two or three months running up to publication day. If a buyer can see an interest from readers before publication date, they will be much more likely to place a large order themselves. Pre-orders contribute to Amazon main rankings and there is also a “next 90 days” pre-order chart. Amazon have a pre-order price guarantee stating that the price a reader pays will be the lowest price offered between the time they place their order up to and including the end of the day of the release date. Don't be disappointed if pre-orders don't match your expectations, the amount of people who express an interest is rarely equivalent to the amount of people who physically order the book. Initial publicity: Our standard publicity is carried out three months before publication date, and your publicist will enter an initial plan to your Marketing page in the "Promotional Plan" section; they will upload and distribute a press release to targeted reviewers, journalists, bloggers, event organizers and other relevant contacts. This is recorded in “Marketing Activities.” These “Contacts” are all on our database and most are available to you too. If you are purchasing Extra Publicity, this starts earlier, six months before publication. Online exposure: Once you see your book on Amazon, join Author Central and start building your and your title’s online presence. For support join one of our Facebook JHP Author Groups, swap reviews and submit articles. See more in Chapter 15. What you can do: Read Chapter 11. Write an Article and enter it on your Marketing page for the publicist to use. Contact your local bookstore to arrange an Event/Signing session. Use the flyers and catalogues available to you on your Marketing page, Promotional Material. Encourage Reviews, particularly on Amazon. Newsletters: One month before publication your title is included in two newsletters. One is sent to subscribed trade and media contacts, and another to readers, signed-up fans of the imprint. Launch: By the first day of the month of publication print books will be in the main warehouses in the USA and UK, and available for events and to the trade. 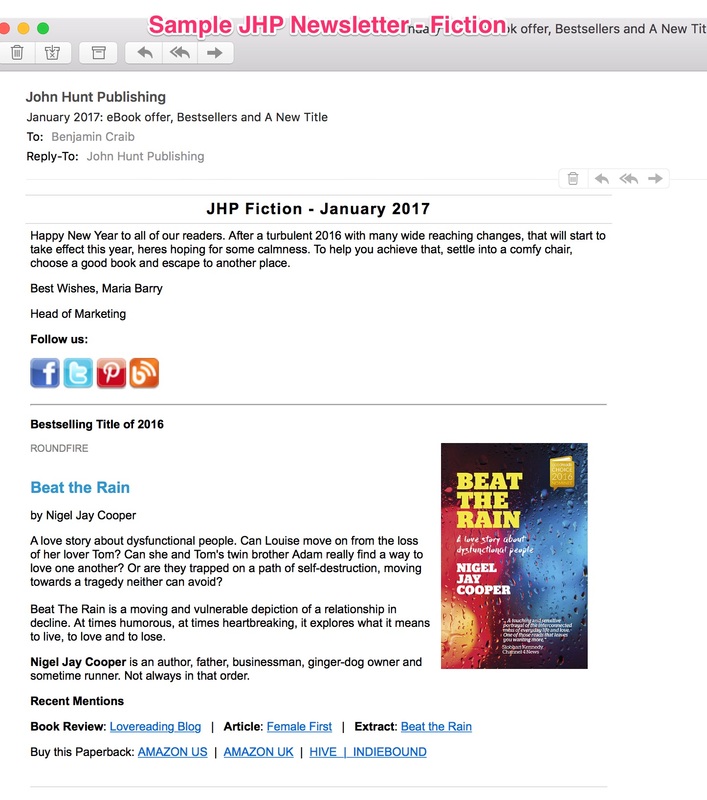 Ebooks are available from publication day and electronic review copies (PDF Review Files) are available six months earlier on your Marketing page. See more on Events in Chapter 11. Three-month review: We review every title after three months to see how it's gone, what can be done. If there are enough Amazon reviews, we will pay for an ebook promotion through a Paid Service. Further publicity: Every time another 500 copies of your title in any format have been sold your publicist will do a further round of publicity. They will put up notes in the Promotional Plan section saying where their focus will be. Extra publicity: Additional PR is available as a paid package. Publicity record: All publicity approaches are recorded on the Marketing page. The initial push is recorded as “Email/Press Release Arranged.” You can filter this list by activity using the drop-down box. For instance, if you select “Review Copies – Requested” in the drop-down boxes and click “Filter Activities List,” all contacts listed here will be contacts who have requested a review copy of your book, either as PDF (electronic version available on the Marketing page under “PDF Review File”) or HC (hardcopy) sent once the stock is received into the warehouse. You will notice that the “Requested” date changes to “Arranged” once a review copy is sent out, and should be updated to “Completed” if a review is published. If you select “Article/Extract” you will see who has requested these. Your publicist will supply extracts and enter them as “Arranged,” and when they have seen the article published will then enter “Date Completed” and supply a link to the article in the “Notes” box of the activity. If an original article is required, your publicist will be in contact with you. Please update any activities we miss. If you select “Interview” you will see requests to interview you on audio or video. There will be some notes in the activity but your publicist will also liaise with you by email to ensure that all arrangements are clear and confirmed. The other selections in “Activities” work in the same way. If you have any queries regarding the activities please report them to the Author Forum: Marketing and Publicity. For downloading files for your own use see Being Your Own Publicist. The Master Communicators Handbook, written by one of our publishers, Tim Ward, and his wife, published in the Changemakers imprint, is a useful introduction to many aspects of marketing.